Freeze dried fruit is often found in the snack aisle at the grocery store. You can even find it packaged as apple/pear/strawberry chips and marketed as a healthier alternative to potato chips. I am not big on snacking on freeze dried fruit because the dry, powdery texture just doesn’t work for me. I do buy a lot of freeze dried fruit, however, because it is an outstanding way to add fruity flavor to a wide variety of baked goods and other treats! What is Freeze Dried Fruit? Freeze dried fruit is not simply fruit that has been dehydrated. Ripe fruit is frozen and then packed into a vacuum chamber where most of the water crystals are sublimated, or turned directly to vapor without going through a liquid state. The fruit is then dried to ensure that no water remains in it. The process retains the color of the Â fruit and preserves most of its nutrients, as well as creating an extremely long shelf life for the products (as long as they are protected from air once they have been freeze-dried). Once freeze dried, the fruit can be rehydrated with water or use eaten/used directly from its dried state. Rehydrated freeze-dried fruit will not have the texture of fresh fruit, but it will not be quite as soggy as frozen fruit that has been defrosted, either. Freeze dried fruit can be stirred directly into recipes for almost any baked good, from cookies to muffins to cakes. 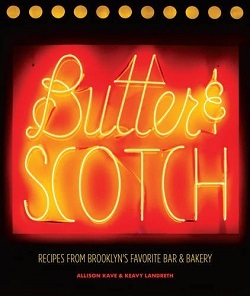 It can be used as a “mix-in” in so many recipes because it contains no excess moisture that could change the consistency of the baked good in question. For instance, fresh strawberries would make a batch of chocolate chip cookies very soggy, but freeze dried strawberries can easily be incorporated to create Strawberry Chocolate Chip Cookies with a great berry flavor and classic chocolate chip cookie texture. Freeze dried fruit can be used in large pieces, which is often how it is packaged, or it can be broken down into smaller pieces. Coarsely chopped freeze dried fruit is a good choice for muffin and cake recipes, but pulverizing it into a powder is a better option in recipes like my Strawberry Limemade Bars. You can place the fruit in a ziploc bag and crush it with a rolling pin until it becomes a powder, however pulsing it in a food processor is a quicker way if you need to make a large quantity of it. If you are making a recipe that uses both sugar and freeze dried fruit, it is often easier to combine the sugar and fruit before pulsing it in the food processor to speed the process.Â Once powdered, freeze dried fruit can be added to recipes to add both color and flavor. One of the simplest applications is to make a batch of Strawberry Sugar, then use it to make homemade Strawberry Milk without artificial colors or flavors. Reading this, you’ve probably noticed that I like to use freeze dried strawberries! This is because freeze dried strawberries are very flavorful and fresh strawberries are not always ideal for baking, since they lose a lot of their texture in the oven. These techniques can be applied to any freeze dried fruit. This recipe for Red, White and Blue Rice Krispy Treats uses two different fruits – and no artificial colors! Small fruits, such as blueberries, will most often be used whole and make a great addition to shortbreads and mini muffins. Larger fruits, such as apples, make a sweet addition to oatmeal cookies and breakfast breads. Get creative! Once you start using freeze dried fruits, you’ll find all kinds of uses for them! I couldn’t find freeze-dried strawberries at my local supermarket or Target when I shopped for the ingredients for the strawberry-limeade bars. I will be heading to Trader Joe’s but is there anywhere other than TJ’s that regularly stocks them? 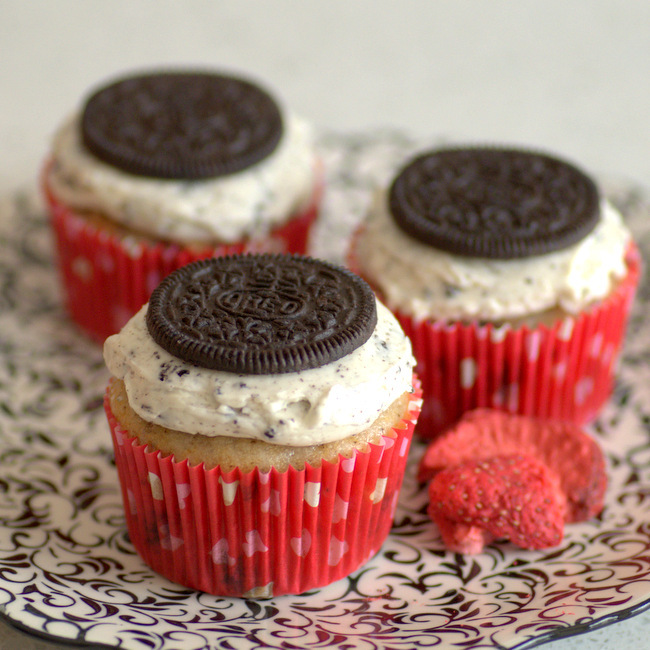 I’m decorating cupcakes with buttercream icing, then sprinkling on freeze dried raspberries. Will the colour bleed? I’m trying to prep for a party and not sure whether to leave the raspberries until the last minute or if they’re ok to do ahead of time? They might leave a little color where they are touching the buttercream (underneath the berries), but they should not bleed much on buttercream. That said, if you’re going to use bigger chunks of the freeze dried fruit, as opposed to a very finely chopped/ground consistency, I would add them on towards the end so that they don’t lose their crisp texture. Can I use freeze dried blueberries for blueberry muffins. Would I have to boil rehydrate first? 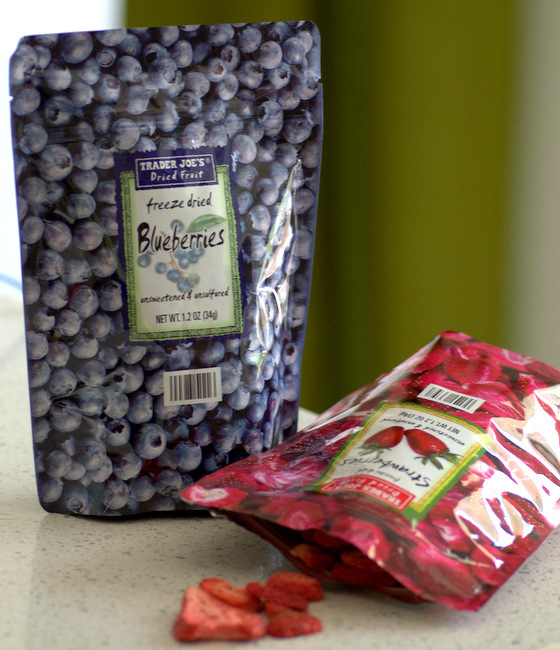 It has been suggested that fresh blueberries CANNOT be substituted eith freeze dried. What do you think? Hi Karine, Berries that have been dried (and are raisin-like) can be rehydrated in hot water, but freeze dried berries can be reconstituted by simply soaking them in room temperature water until they have plumped and softened. I personally find that freeze dried fruit seems to lose some of its sweetness once reconstituted, but it will still be flavorful. The texture will also be like that of cooked fruit. In short, you can use rehydrated freeze dried blueberries in a muffin recipe, but I would not use them in a recipe that relies on the moisture and texture of fresh berries, such as a pie. Sounds good! Can I make a strawberry rhubarb pie from freeze dried fruit? No, I wouldn’t use freeze dried fruit as a filling in a fruit pie. It looses too much texture when it is reconstituted, so I don’t think that you would be satisfied with the results. I would consider using them in a filling that was non fruit-based, however, such as flavoring a cheesecake pie filling! Hi, I am excited to find these tips. I am baking vanilla cakes from a (GF) mix. I want to color and flavor the cakes with pulverized dehydrated strawberries. Do I need to make any adjustments to the amount of liquid in the cake? I am concerned the dehydrated powder will make the cake dry. Fortunately, you won’t need a tremendous amount of the powder to flavor and color the cakes (likely less than 1/4 cup, but it’s hard for me to guess without seeing the mix). You shouldn’t need to adjust the liquid with that amount. And when cake mixes are concerned, they’re usually formulated to be flexible with additions. You should be just fine – so good luck with the cake!